Inside (stylized as INSIDE) is a puzzle-platformer adventure game developed and published by Playdead in 2016 for PlayStation 4, Xbox One and Microsoft Windows. The game was released for iOS in December 2017. The player controls a boy in a dystopic world, solving environmental puzzles and avoiding death. It is the spiritual successor to Playdead's 2010 game Limbo, and features similar 2.5D gameplay. Playdead began work on Inside shortly after the release of Limbo, using Limbo's custom game engine. The team switched to Unity to simplify development, adding their own rendering routines, later released as open source, to create a signature look. The game was partially funded by a grant from the Danish Film Institute. 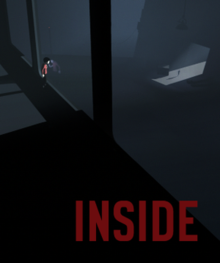 Inside premiered at Microsoft's E3 2014 conference, with a planned release in 2015. The game was released for Xbox One on June 29, 2016, Microsoft Windows on July 7, PlayStation 4 on August 23, for iOS and Apple TV on December 15, 2017 and for Nintendo Switch on June 28, 2018. Inside is a puzzle platformer. The player character is an unnamed boy who explores a surreal environment presented as a monochromatic 2.5D platform game. The game is dark, with color used sparingly to highlight parts of the environment, and mostly silent, with occasional musical cues. The player controls the boy who walks, runs, swims, climbs, and uses objects to overcome obstacles and progress in the game. The boy gains the ability to control bodies to complete certain puzzles, a mechanic that IGN's Marty Sliva compared to a similar mechanic in The Swapper. At various points in the game, the player may discover hidden rooms containing glowing orbs. If all the orbs are deactivated during a playthrough, the player unlocks the game's alternate ending. The boy can die in various ways, such as being shot with a tranquilizer dart, mauled by dogs, ensnared by security machines, blown apart by shockwaves, or drowning. As in the predecessor game Limbo, these deaths are presented realistically and are often graphic. If the character dies, the game continues from the most recent checkpoint. A boy slides down a rocky incline. While running through a forest, he encounters masked guards with flashlights, as well as vehicles with mounted spotlights, and fierce guard dogs. He escapes the guards, then crosses a road where a block has been set up with more vehicles and guards, to a farm where parasitic worms cause pigs to run rampant. The boy uses the farm animals and equipment to escape to a seemingly-abandoned city where lines of zombie-like people are moved through mind control. Beyond the city is a large factory of flooded rooms, a shock wave atrium, and a laboratory environment where scientists perform underwater experiments on bodies. While traversing these areas, the boy uses a mind-control helmet to control lifeless grey bodies. The boy eventually comes across an underwater siren-like creature that attaches a device to him, allowing him to breathe underwater. Continuing through the office and laboratories, the boy sees scientists observing a large spherical chamber. The boy enters the chamber and discovers a large blob-like creature, the Huddle, made of humanoid limbs connected to four control rods. After disconnecting the rods, the boy is pulled into the Huddle. The Huddle escapes confinement, crashing through offices, killing some of the scientists in its path. The scientists trap the Huddle in another tank, but the Huddle escapes again and breaks through a wooden wall. It rolls down a forest hill and comes to a stop at a grassy coastline bathed in light. If the player deactivated the hidden light orbs in the various bunkers, the boy returns to one of the bunkers and gains access to a new area. He reaches an area that includes a bank of computers and one of the mind-control helmets, powered by a nearby socket. The boy pulls the plug from the socket, upon which the character takes the same stance as the zombies, and the game ends moments later. Journalists and players have offered several different theories about the game's main ending (the freeing of the Huddle) and the alternative ending. One theory speculates that the boy is controlled by the Huddle throughout most of the game, leading him to help free the Huddle from containment. As described by Jeffrey Matulef of Eurogamer, the game impresses that the Huddle has a magnetic-like draw that leads the boy to endanger himself and unquestioningly enter the tank where the Huddle is kept so as to free it. Players speculated on the theory that taking the alternate ending is working contrary to the Huddle's goal, and the act of unplugging the computers is to release the Huddle's control on the boy. A similar theory has the boy being controlled by one or more of the scientists, evidenced by how some of the scientists appear to aid the Huddle in escaping the facility. In this theory, the scientists put the boy through many dangers to gain strength and intelligence, so that these qualities can be absorbed by the Huddle when the boy frees it, improving the creature in a desirable manner for these scientists. A more metafiction interpretation of the game from its alternate ending, and considered the most popular among players, is based on the notion of player agency. Matulef summarizes this theory as "the boy is being controlled by a renegade force represented by the player". The act of pulling the plug in the final area is similar to the concept of The Matrix, as described by PC Gamer's Tim Clark. Matulef explains that the location of the alternate ending is only known to the player with knowledge of the main ending and not to the Huddle or the scientists. With knowledge of the game's true ending, achieving the alternate ending is to reach a conclusion to the game that "ostensibly puts an end to the boy, the blob, and any inhumane experiments being conducted". Playdead released the monochromatic Limbo in July 2010, which was critically praised and sold over one million units. Within a few months of its release, Playdead began development on their second game under the working title "Project 2". As a spiritual successor to Limbo, Inside reclaimed assets from Limbo's development. Playdead said that the two games were similar, though Inside is more "crazy", "weird", and 3D. The Danish Film Institute provided one million dollars in funding towards the game. While Playdead had built a custom game engine for Limbo, they chose Unity to reduce their workload. The developers created a temporal anti-aliasing filter for the engine, entitled "temporal reprojection", to create a signature look for Inside. In March 2016, Playdead released the source code under an open source license. 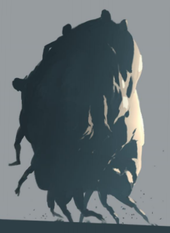 2010 concept art of the Huddle by Morten Bramsen. The art helped animate the Huddle and drive Inside's art direction. Microsoft announced Inside during its E3 2014 press conference. Prior to this, the game had been planned for release on non-Microsoft platforms, including the PlayStation 3 and OS X. Playdead had purposely waited four years so as to give little time between the announce event and the launch. IGN's Ryan McCaffrey wrote that the announcement was a sign of Microsoft's commitment to indie game development and said it was his biggest surprise of the year. The developer later delayed the game from its expected early 2015 release for further refinement of the game, but provided no expected launch window. A playable demo was prepared for an August 2015 Microsoft event before PAX Prime. With the delay, Playdead only planned for initial release on the Xbox One and Microsoft Windows, but had expressed interest in other consoles in the future. Playdead announced Inside's release dates during E3 2016, and as a limited-time promotion, let players download Limbo for free in advance of the title's release. Inside was released for Xbox One on 29 June 2016, and for Windows via Steam on 7 July. Ports for other platforms followed: the PlayStation 4 version was released on 23 August,  the iOS version on December 15, 2017, and the Nintendo Switch version on June 28, 2018 alongside the release of Limbo. 505 Games published Inside and Limbo as a dual-game retail package for Xbox One and PlayStation 4, which was released in September 2017. Martin Stig Andersen, with SØS Gunver Ryberg, composed and designed Inside's soundtrack, returning from Limbo. Andersen was inspired by 1980s B horror films, often using synthesizers, but did not want to compose an actual soundtrack. Instead, he created the music by routing sound through a human skull and recording the result, a "bone-conducting sound" that created a "sombre, chill quality" that often complements Inside's visuals. Inside has tighter integration of the gameplay and audio, with some puzzles set directly to visual-musical cues. This required Andersen to work more closely with the gameplay developers than he had in Limbo. This enabled additional visual elements tied to the audio; Andersen noted that the boy's chest movements related to breathing are tied to the sound effects he created for his breathing, which themselves are influenced by where the character is in the game, with differences being calm and panicked emotions depending on location. Andersen suggested the design team on the game's overall structure and pacing to provide scenes where the music builds up atmospheric tension. Inside received universal acclaim, according to video game review aggregator Metacritic. Critics favorably compared the title as a worthy successor to Limbo. The game was one of Polygon and IGN's most anticipated 2016 releases. From previewing the game at E3 2016, IGN's Marty Sliva considered the title to be "Super Limbo", polishing and improving from Playdead's first game into the new title in the same manner that Nintendo had done for its previous games in bringing them to the Super Nintendo Entertainment System. Kirk Hamilton of Kotaku called the game an "evolution" on what Playdead has succeeded to do with Limbo. Jaz Rignall of USgamer previewed Inside and wrote that it was one of the best puzzle platformers he has played, even better than its predecessor. The game won the awards for "Golden Cube" and Best Desktop/Console Game" at the Unity Awards 2016, and it also won the award for "Best-Looking Game" at the Giant Bomb 2016 Game of the Year Awards, whereas its other nomination was for "Best Moment or Sequence". At The Edge Awards 2016, the game came in second place each for "Best Visual Design", "Best Storytelling" and "Studio of the Year", and it came in third place for "Game of the Year", while it won the award for "Best Audio Design". ^ Rignall, Jaz (June 13, 2016). "Xbox One Inside is a Superlative Platform Puzzler". US Gamer. Retrieved June 13, 2016. ^ a b c Sliva, Marty (June 13, 2016). "E3 2016: Inside is Super Limbo in the Best Possible Way". IGN. Retrieved June 13, 2016. ^ Hillard, Kyle (June 29, 2016). "How To Find All Of Inside's Hidden Rooms And The Alternate Ending". Game Informer. Retrieved July 8, 2016. ^ a b Tamburro, Paul (July 6, 2016). "Inside's Ending and Why it Puts Other Video Games to Shame". CraveOnline. Retrieved July 11, 2016. ^ "Huddle up! : Making the [SPOILER] of 'INSIDE'". Game Developers Conference. Retrieved December 19, 2016. ^ a b c d e Matulef, Jeffrey (July 8, 2016). "What's going on at the end of Inside?". Eurogamer. Retrieved July 11, 2016. ^ Tamburro, Paul (July 1, 2016). "Inside's Ending Explained: Our Theory On the Limbo Sequel's Brain-Bending Conclusion". CraveOnline. Retrieved July 11, 2016. ^ a b Klepek, Patrick (July 13, 2016). "The Wild Theories Behind Inside's Secret Ending". Kotaku. Retrieved January 24, 2017. ^ PC Gamer Staff (July 11, 2016). "Inside's weirdest moments and bizarre ending: a spoiler discussion". PC Gamer. Retrieved January 24, 2017. ^ a b c Philip Kollar. "Inside is the next game from Limbo creators Playdead Studios". Polygon. ^ a b c d Andrew Goldfarb (July 27, 2012). "Limbo Follow-Up Project 2 is 'At Least 2 Years Away'". IGN. ^ a b Samit Sarkar. "Inside, upcoming game from Limbo developer Playdead, delayed past 'early 2015'". Polygon. ^ a b c d Andrew Goldfarb (October 28, 2011). "Limbo Follow-Up Will be 'More Crazy'". IGN. ^ "Playdead's Project 2 uses Unity, may share 'ideas' with Limbo". engadget.com. ^ Goldfarb, Andrew (July 27, 2012). "Limbo Follow-Up Project 2 is 'At Least 2 Years Away'". ign.com. ^ Rignall, Jaz (June 28, 2016). "Inside Xbox One Review: Brilliant and Compelling". usgamer.net. ^ "E3 2016: Inside Preview: Unsettling Feelings". shacknews.com. ^ Harman, Stace (June 14, 2012). "Playdead's Limbo follow-up, new details and concept art". VG247. Retrieved August 28, 2016. ^ Rose, Mike (August 25, 2011). "Limbo Developer Playdead Using Unity Engine For Next Title". Gamasutra. Retrieved May 12, 2015. ^ Wawro, Alex (March 22, 2016). "Limbo dev open-sources its Unity 5 anti-aliasing tech". Gamasutra. Retrieved June 14, 2016. ^ a b c d e f g "Huddle up: Making the SPOILER". GDC Vault. March 3, 2017. Retrieved March 14, 2017. ^ Lucy O'Brien (June 9, 2014). "E3 2014: Microsoft is all About the Games". IGN. ^ IGN Staff (December 24, 2014). "The Biggest Surprises of 2014". IGN. ^ Carter, Chris (June 5, 2015). "Limbo developer's follow-up 'Inside' sees a delay". Destructoid. Retrieved June 5, 2015. ^ Brandin Tyrrel (August 14, 2015). "Limbo Followup Inside Playable at Xbox PAX Event". IGN. ^ Sanchez, Miranda (June 13, 2016). "E3 2016: LIMBO FOLLOW-UP INSIDE GETS A RELEASE DATE". IGN. Retrieved June 13, 2016. ^ Nunneley, Stephany (August 3, 2016). "Playdead's Inside has a date with PlayStation 4 at the end of this month". VG247. Retrieved August 3, 2016. ^ Paget, Mat (August 23, 2016). "PS4 Owners Can Now Play Critically Acclaimed Game Inside". GameSpot. Retrieved August 23, 2016. ^ Devore, Jordan (December 11, 2017). "Playdead is bringing Inside to iOS on Friday". Destructoid. Retrieved December 12, 2017. ^ Webster, Andrew (December 15, 2017). "The dark, unsettling adventure Inside is now on the iPhone". The Verge. Retrieved December 15, 2017. ^ Kuchera, Ben (June 28, 2018). "Nintendo eShop update brings Wolfenstein 2, Crash Bandicoot and more". Polygon. Retrieved June 29, 2018. ^ Frank, Allegra (June 28, 2017). "Limbo and Inside are heading to retail in one pack". Polygon. Retrieved June 28, 2017. ^ a b c Broomhall, John (July 23, 2015). "Heard About: How Playdead used a real human skull for Inside's audio". Develop. Retrieved June 14, 2016. ^ a b "Inside for PC Reviews". Metacritic. Retrieved July 7, 2016. ^ a b "Inside for PlayStation 4 Reviews". Metacritic. Retrieved July 7, 2016. ^ a b "Inside for Xbox One Reviews". Metacritic. Retrieved July 7, 2016. ^ Makedonski, Brett (June 28, 2016). "Review: Inside". Destructoid. Retrieved June 28, 2016. ^ "Inside". Edge. Future (296): 120. September 2016. ^ Carsillo, Ray (June 28, 2016). "Inside review". Electronic Gaming Monthly. Retrieved June 28, 2016. ^ Hillard, Kyle (June 28, 2016). "An Engaging Interactive Nightmare – Inside – Xbox One". Game Informer. Retrieved June 28, 2016. ^ Paras, Peter (June 28, 2016). "Inside Review". Game Revolution. Retrieved June 28, 2016. ^ Newhouse, Alex (June 28, 2016). "Inside Review". GameSpot. Retrieved June 28, 2016. ^ Sullivan, Lucas (June 28, 2016). "Inside review". GamesRadar. Retrieved June 28, 2016. ^ Shoemaker, Brad (June 28, 2016). "Inside Review". Giant Bomb. Retrieved June 28, 2016. ^ McCaffrey, Ryan (June 28, 2016). "Inside Review". IGN. Retrieved June 28, 2016. ^ Kelly, Andy (July 7, 2016). "Inside review". PC Gamer. Retrieved July 7, 2016. ^ Robinson, Nick (June 28, 2016). "Inside Review". Polygon. Retrieved June 28, 2016. ^ Orry, Tom (June 28, 2016). "Inside Review". VideoGamer.com. Retrieved June 28, 2016. ^ Hodapp, Eli (December 14, 2017). "'Inside' Review – Try, Die, and Try Again". TouchArcade. Retrieved June 6, 2018. ^ Dolan, Christian (June 28, 2016). "Inside Review". Eurogamer. Retrieved June 28, 2016. ^ Peckham, Matt (June 28, 2016). "Inside Review". Time. Retrieved June 28, 2016. ^ Kohler, Chris (June 28, 2016). "Inside Review". Wired. Retrieved June 28, 2016. ^ Webster, Andrew (June 28, 2016). "Inside is an incredible, unsettling adventure from the creators of Limbo". The Verge. Retrieved June 28, 2016. ^ "Ooooh pretty – The games of 2016". Polygon.com. ^ Chloi Rad (January 1, 2016). "32 Games to Keep on Your Radar in 2016". IGN. ^ Hamilton, Kirk (June 13, 2016). "The Limbo Crew's New Game INSIDE Is Utterly Fantastic". Kotaku. Retrieved June 13, 2016. ^ Rignall, Jaz (June 13, 2016). "Xbox One Inside is a Superlative Platform Puzzler". USgamer. Retrieved June 14, 2016. ^ "Unity Awards 2016 - Winners". Unity. Retrieved December 20, 2016. ^ "Giant Bomb's 2016 Game of the Year Awards: Day Two". Giant Bomb. Retrieved March 16, 2017. ^ "The Edge Awards". Edge. Future (302): 76–87. February 2017. ^ Sheridan, Connor (November 18, 2016). "Overwatch scoops five awards, Firewatch wins Best Indie Game: Here are all the Golden Joystick 2016 winners". GamesRadar. ^ Loveridge, Sam (September 15, 2016). "Golden Joystick Awards 2016 voting now open to the public". Digital Spy. Retrieved October 29, 2016. ^ Makuch, Eddie (November 16, 2016). "All the 2016 Game Awards Nominees". GameSpot. Retrieved November 16, 2016. ^ Stark, Chelsea (December 1, 2016). "The Game Awards: Here's the full winners list". Polygon. Vox Media. Retrieved December 1, 2016. ^ Makuch, Eddie; Imms, Jason (February 23, 2017). "Overwatch Wins DICE Game of the Year, Full Nominees List". GameSpot. Retrieved February 23, 2017. ^ Hall, Charlie (January 9, 2017). "Hyper Light Drifter, Inside and Virginia among nominees for 2017 IGF Awards". Polygon. Retrieved January 9, 2017. ^ a b Makuch, Eddie; Imms, Jason (March 1, 2017). "Watch The Game Developers Choice Awards Right Here Tonight". GameSpot. Retrieved March 1, 2017. ^ "Inside, Overwatch & Firewatch lead GDC 2017 Choice Awards nominees". Gamasutra. January 4, 2017. Retrieved January 4, 2017. ^ Makuch, Eddie (January 25, 2017). "All The 2017 SXSW Game Award Nominees". GameSpot. Retrieved March 5, 2017. ^ "Announcing the 2017 SXSW Gaming Awards Winners". March 18, 2017. Retrieved April 6, 2017. ^ wbber, Jordan Erica (March 9, 2017). "Bafta games awards 2017: Inside and Uncharted 4 lead the way". The Guardian. Retrieved March 9, 2017. ^ "British Academy Games Awards Winners in 2017". April 6, 2017. Retrieved April 6, 2017. This page was last edited on 19 April 2019, at 02:11 (UTC).